Kangaroo's premium blend has been scientifically designed for women to inscrease pleasure and performance. Kangaroo is formulated to promote vaginal lubrication and enhance longer & more frequent orgasms. This pill works so good most women should only take 1/2 dose! 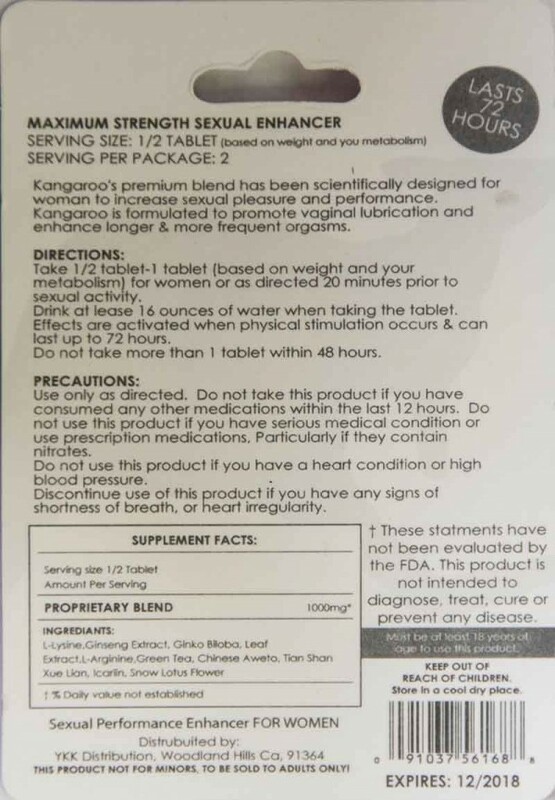 Take 1/2 tablet - 1 tablet (based on weight and your metabolism) for women or as directed 20 minutes prior to sexual activity. Drink at least 16 ounces of water when taking the tablet. Effects are activated when physical stimulation occurs & can last up to 72 hours. Use only as directed. Do not take this product if you have consumed any other medication within last 12 hours. Do not use this product if you have serious medical condition or have taken prescription medications. Particularly if they contain nitrates. Do not use this product if you have a heart condition or high blood pressure. Discontinue use of this product if you have any signs of shortness of breath, or heart irregularity. Always consult with a medical professional before taking this or any other product. Not for use by children and minors. Check with a qualified healthcare professional before taking this product. Not for use if you have any heart problems or high blood pressure. This was literally a waste of money. It’s been two hours and nothing, I drank the water and everything. I would like my money back.